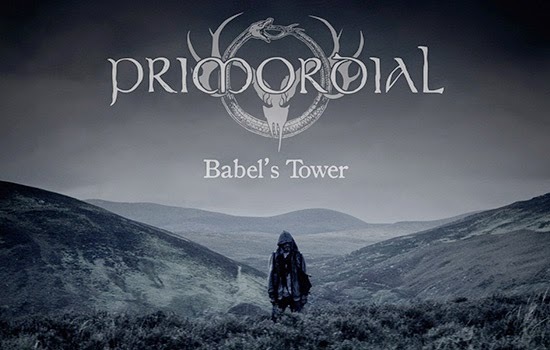 Today, Irish metal legion, PRIMORDIAL, unveils the official new music video for "Babel's Tower." The epic tune comes by way of the band's imminent new full-length, Where Greater Men Have Fallen, and serves as the first ever professionally filmed and edited video of their storied history. Elaborates the band, "It was really about time, right? This far down the road, we finally made our first video eight albums in. So we trusted Gareth Averill and crew who also made our DVD [All Empires Fall] a couple of years back. The traditional band-jamming-in-a-warehouse scenario was not something that entered our heads. We wanted something broad and cinematic; something visually striking and arresting. So we spent a couple of cold and windswept days standing on the side of a mountain in Ireland. Here you have it, and about time…"